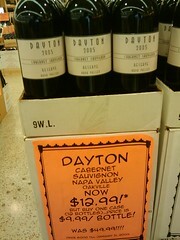 I was in this Chinese supermarket in “Chinatown 2: Chinatown in the Suburbs” here in Los Angeles, and my friend excitedly pointed out to me the awesomest product to ever hit the shelves (or at least since the Trapper Keeper and Cash Register) – it’s DAYTON WINE! Viola. The world’s greatest wine. Or at least I’m assuming. I’ll taste it later and tell you what I think.